A well-known exploded star that is pumping out powerful gamma rays may be the celestial smoking gun astronomers have in the search for the origins of some of the fastest-moving particles in the universe, a new study reports. NASA's Fermi space telescope has detected gamma rays — the highest-energy form of light — emanating from the shattered husk of Tycho's supernova, a star that exploded in 1572. The find could help astronomers pinpoint the origin of cosmic rays, super-speedy subatomic particles that crash constantly into Earth's atmosphere, researchers said. "This detection gives us another piece of evidence supporting the notion that supernova remnants can accelerate cosmic rays," study co-author Stefan Funk, of SLAC National Accelerator Laboratory and Stanford University in California, said in a statement. Observation of Tycho's supernova was one of the watershed moments in the history of astronomy, researchers said. At the time, most people regarded the sky as a fixed, unchanging part of the universe. But they couldn't hold onto that view after "Tycho's star" burst onto the scene. And now, more than 400 years later, studying the supernova is yielding further insights. Fermi found gamma-ray emissions emanating from Tycho, which could shed light on where cosmic rays come from. Just where and how cosmic rays, most of which are protons, attain their incredible speeds and energies is a long-standing mystery in astrophysics. Charged particles are easily deflected by interstellar magnetic fields, so it's tough to trace them directly back to their sources, researchers said. But astronomers have long suspected that supernovas are a key source of cosmic rays. After a star goes boom, it becomes a rapidly expanding shell of hot gas bounded by the explosion's shock wave. Magnetic fields on either side of the shockwave trap particles, the idea goes, bouncing them back and forth very rapidly. The particles gain energy with each bounce, eventually getting so amped up that they burst free of the magnetic fields and start zipping through interstellar space. 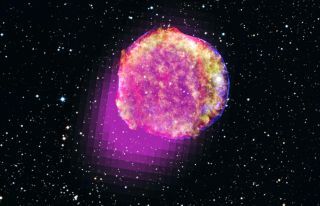 The new gamma-ray detection in Tycho's supernova remnant supports that scenario, researchers said. It appears that some protons are being accelerated to near light speed within the remnant, then smashing into other, slower-moving particles. These collisions produce the gamma rays that Fermi picked up. Fermi's ongoing sky survey is providing additional evidence that supports supernovas as cosmic-ray sources, researchers said. Many younger remants, such as Tycho, are seen to generate more high-energy gamma rays than older remnants. "The gamma-ray energies reflect the energies of the accelerated particles that produce them, and we expect more cosmic rays to be accelerated to higher energies in younger objects because the shockwaves and their tangled magnetic fields are stronger," Funk said. The researchers reported their results in the Dec. 7 issue of The Astrophysical Journal Letters.